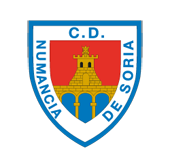 Numancia put in a fine performance at Riazor to earn a 2-2 draw against Deportivo de la Coruña in a game that had a beginning, a middle and an end. In the opening stages, Numancia found it hard to live with their hosts, who came out with all guns blazing. The middle part showed that football is not a place for the faint-hearted. The second half, in which the Numantinos offered a footballing master class against a Deportivo side who are favourites to go up this season, deserves to be framed. López Garai called up the same 18 players as he had last week and sent out the same ones who had beaten Nàstic so convincingly. Deportivo, though, scarcely gave them any options in the first half. Very solid at the back, sharp up front, the hosts were very confident of their chances at home, where they are the strongest side in the division. Until this weekend they had won all but one of their fixtures at Riazor, conceding only a draw to Málaga, and they are also helped by having one of the largest budgets: €61 million. With all that in their favour, the game started off nicely for them. They pressed from the word go, looking for an early goal, and Numancia were able to offer little resistance. Playing with fear, the Sorianos went behind in the tenth minute, when Edu Expósito’s powerful drive from just inside the box fizzed past Juan Carlos into the top corner. A goal up, and with the visitors now chasing the game, Dépor were able to play the way they wanted. They stepped back, let Numancia dominate possession, and looked to kill the game on the break. Having the ball, the Numantinos began to manage the situation better. At least they were able to reach Dani Giménez’s area threateningly on a few occasions and create danger from a couple of corners and free-kicks. Even still, Lópz Garai’s side still lacked self-confidence and poise in their decision-making. Shortly before the half-hour mark, Deportivo added the second goal. Diamanka’s poorly-placed back-pass gifted Borja Valle with a chance that he took well, firing the ball across Juan Carlos into the far corner. Two goals behind, in a hostile scenario, it was an uphill struggle that Numancia now had before them. They do know a little history though, and about epic struggles and not surrendering ever. And the panorama changed radically in the second half. A fine headed effort from Higinio that had the ‘keeper beaten and was only kept out by the post was the turning point, the moment in which the Rojillos got back into the game. For the second half, Nacho was replaced by Alain Oyarzun on the wing, while in the 58th minute Borja Viguera came on for Higinio in attack. These substitutions, and the change in the team’s attitude did the rest. The Basque winger turned out to be instrumental in the fightback since both goals originated from his left foot. For the first, he reached the goal line and centred for Unai Medina to head home at the far post. This gave the Rojillos hope and something to fight for in the remaining half hour and they scared off their ghosts, put aside their fears and started to put the Coruña goal under pressure. 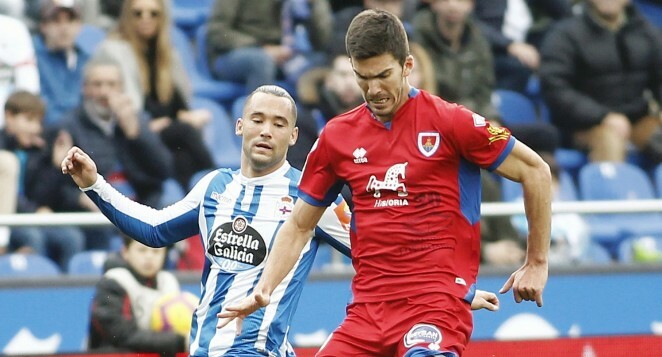 It was necessary to take risks, and Numancia took them, aware that there was always the danger of a Deportivo counterattack or a piece of quality play from the likes of Carles Gil, Eduardo Expósito or Quique. Little by little, though, the visitors had ever more of the ball, found ways past the midfield and penetrated down the wings. With a little more than ten minutes to go, another excellent cross from Alain Oyarzun found Diamanka at the far post, and the Senegalese player headed home to level the scores. All the fears shown in the first half had by now dissipated and Numancia looked grand, on the majestic stage that Riazor is. The travelling fans enjoyed the final minutes, many believed a third goal might come, but in the end the scoreline stayed at two-all. A fine point earned from an impressive second-half display. Deportivo: Dani Giménez, Saúl, Pedro Mosquera (Bergantiños, m 65), Domingos Duarte, Quique, Vicente Gómez, Carles Gil (Christian Santos, m 84), Borja Valle, Edu Expósito (Krohn-Dehli, m 78) Pablo Marí, Eneko Bóveda. CD Numancia: Juan Carlos, Escassi, Higinio (Viguera m 58), Nacho (Alain Oyarzun, m 46), Yeboah (Kako, m 89), C. Gutiérrez, Medina, Atienza, Marc Mateu, Fran Villalba, Diamanka. Referee: Arcediano Monescillo (Castilla La Mancha Committee). Assisted by Escuderos Sánchez and Villaseñor Julián. Yellow cards for Vicente Gómez and Saúl, twice, for which reason he was sent off in the 90th minute. Goals: 1-0. Minute 10. Edu Expósito. 2-0. Minute 29. Borja Valle. 2-1. Minute 58. Unai Medina. 2-2. Minute 77. Diamanka.